My friend Roger was in Pasig one time and texted me if I wanted some siopao. Not some regular siopao, but probably the biggest one there is in town. In my head popped "blog material!" so I said sure! Soon enough, I found myself walking to over office pantry with the mysterious siopao. 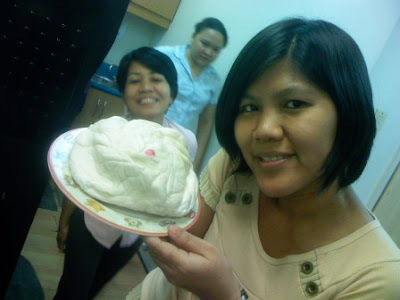 Officemates dropping by for coffee expressed surprise and delight at how big the siopao was! 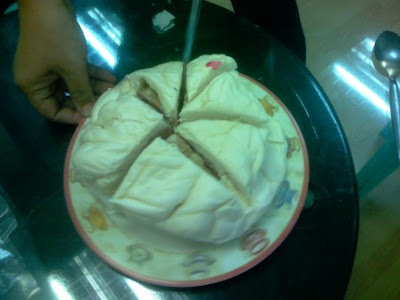 I invited them for a cuppa and they gamely helped divide the siopao for the group. The size notwithstanding, the giant siopao tasted like... umm... siopao! It was yummy, and the meaty inside was huge as well. It's good for three to four people for merienda. Unfortunately, I have forgotten how much it was, and where it was bought from. I'll ask when I get the chance to contact Roger.